The surgeon general has found running up mountains may cause excessive euphoria and prolong your life. However, it can also be dangerous! Some of the information found on these pages is based only on my opinions and personal experiences. Some links may take you to the opinions and personal experiences of others. Only you can decide what is best for you! 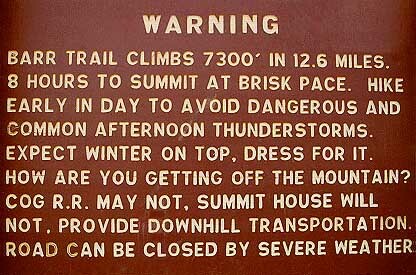 for the Pikes Peak Ascent is only 6 hours and 30 minutes. Pikes Peak Marathon and Americas Ultimate Challenge are trademarks and service marks owned by Pikes Peak Marathon, Inc.